Mainstream Machinima is a great pair of words, and one that has legs. 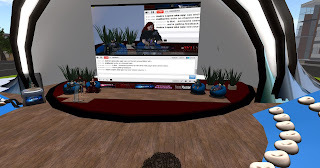 The Machinima-Expo 2012 has ended and the interest in this medium continues to grow. Bringing people together from their fields of games, media and journalism on the topic, reveals greater depth not only of coverage but true understand the nature of what we can offer with our game engine films. The great takaway of a true "Indie movement" is not lost on this audience, and Dean Takahashi wrote a great review of his panel which appeared in VentureBeat. You should have a read of his article, and (a look at his avatar of course!) as this expert panel analyzes machinima and offers great words on topics of the future of what we are doing. He also includes links back to the films and the programming. Enjoy! Its a virtual and very animated group here! 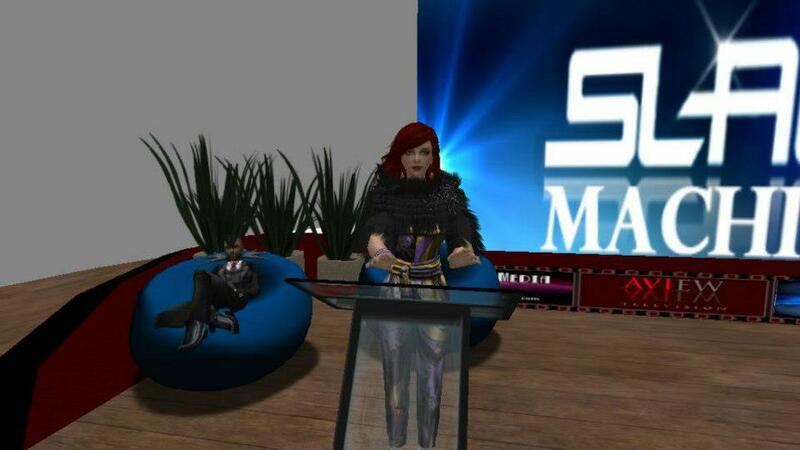 This year was the first for SLACTIONS devoting a full program to Machinima. This great cultural organization is one that promotes education and understanding of virtual platforms. Pooky was asked to deliver the Keynote address and below is the text from this event. This week I clicked on a link, something I do quite often and for a large variety of reasons. To see a film I need to judge for a festival such as this, to read an article or look at a blog, to see how many views something I have produced has gotten, to laugh, to be moved. We click, we look, and we lean into the screen to see what is appearing, unfolding and delighting us. We allow ourselves to be vulnerable to the emotion what we are watching does to us, because we are in an intimate relationship now with Video. We share the good stuff, and keep some videos much closer. Sometimes we don’t even feel alone anymore because of the wealth of work that is in front of us, and of course the deadlines, which are in back of us. Sometimes gently breezing through the airscape, sometimes pounding us for attention. We in Machinima can sometimes chose how to work within these deadlines, whether we work with a 24/7 team from all around the globe. Filling in for one another when time zones mean someone has to finally go to sleep, or sitting solo flying like a captain, off into many blue & green screen yonders. We are at our helm and at our passion, riding our ship of vision and visual clues through a myriad of buttons, animations, frame rate juggling acts as well as beauty, memory, terror and outrage. And let’s not even mention Power outages, or what we sacrifice to get a bit of extra bandwidth at times. We are creators in a universe we understand. It has been said that man did not create the Universe so it can never be fully understand it, but man has created this metaverse, and within our chosen worlds we see that this edge of tomorrow might appear flat to others, but to us it is endless, unfolding like our imaginations. And where other people see gray prims, we see possibilities, for that which hasn’t rezzed for others, we actually dream about in a new state of lucid dreaming which incorporates our daily visual journals into much more. And when we wake, we can give life to these dreams and concepts, which come to us in our subconscious and not only because we are over tired and most likely hallucinating. No, it is because we are living through that veil in between dreams and waking state. We have come to respect that place for our field of visions. We are listening and paying attention to those images and that visual truth that speaks to us – we are awake in our dreams and then, we are authoring them daily, making notes, making edits and the spill over effect of this, is that we share. And we show and we can illuminate Your thinking with Our images, our dreams. That is a pretty powerful tool indeed, those of us in the machinima community watch a lot of each others content and it informs us, inspires and pushes us. In it’s way we are living a collective dream with one another – again quite powerful. Will we ever get tired of watching moving pictures? I think visual pictures are in our DNA – from the old hearth - We now have a virtual campfire to fascinate us. Video is, as we all know such a powerful way of communicating, and of finding meaning. Recently meaning took on a new dimension for me as I saw a video that showed me something so much greater because it was in concept, actually a way to live within art. I am talking about the installation of Vincent Van Gogh's Virtual world of paintings - recreated as the little bedroom in Arles, or the fields of flowers he became so well known for. When you can live in a painting, and study it from the inside out, then you your reality becomes their dream, and isn’t that in some ways what we also try to do with our work? To involve the person watching it so fully they are living through it with us. Our being able to connect through film means the audience understands intuitively because we were successful at communicating. Perhaps they can see more than we knew. Because we only have one par of eyes – but with your eyes and your eyes and your eyes there is so much more sight. Van Gogh, whose single painting of Dr. Gachet sold for S$138.4 million, did not sell one painting in his lifetime outside of to his brother Theo. To have such a gift as Van Gogh is priceless, to own a painting of Van Gogh is to be rich in other ways. So I ask you to consider this – would you rather BE a van Gogh or OWN a Van Gogh? The thought of having that much of a creative gift might be a burden – and surely it is easier to have the cash and do as one wants. Yet I think of this as I stand in front of the machinima community and know that we would chose craft over money. In our new medium and in this moment we do all we can to inhabit our art as well as portray it, so that others may truly see and experience it more fully. Machinexpo/SLactions 2012 from The Movies FR on Vimeo. This year we took a theme for the Expo that would reflect what is important as we move forward. In this decade of increased awareness on all levels of the Entertainment industry on the value and validity of games, "Let's Get Real" is what we chose. Let's Get Real means, in game engine film making, a celebration of the craft of machinima film making (which is something the Expo has been doing since 2008 by the way) and the exploration of where, how, what and why we are getting better and bigger all the time. We are a growing field and the demand for excellence is a call we hear and honor in the work we do. Please, join us!